Help us select the official artwork for the 28th Annual Colorado Mountain Winefest! Fill out the form below to join our voting list. Once subscribed, you will receive your online voting ballot at the email address provided. Voting ends January 25th, 2019 at 6:30 pm. 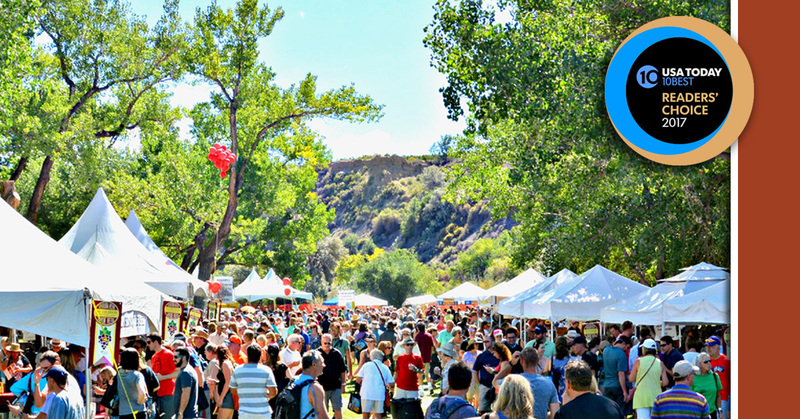 Colorado Mountain Winefest has been nominated by USA Today 10Best as a contender for Best Wine Festival in the U.S.! We would love to bring home the award for 1st place, but we need your help. Please take a few seconds to cast your vote. Participants are allowed to vote once per day until the deadline on Monday, August 14, 2017. Spread the word to your fellow Winefest enthusiasts and vote as often as you can! Curious what all the hype is about? Come find out for yourself! Colorado Mountain Winefest is the largest wine festival in Colorado, with over 55 wineries offering unlimited wine samples. Tickets include entrance to the Festival in the Park, a commemorative tasting glass, wine tote and so much more! Come enjoy live music, chef demonstrations, educational seminars, and the ever popular grape stomp! Tickets sell out fast, make sure to get yours today! Sign up for the CAVE email to receive the latest news about wine-related events in Colorado!